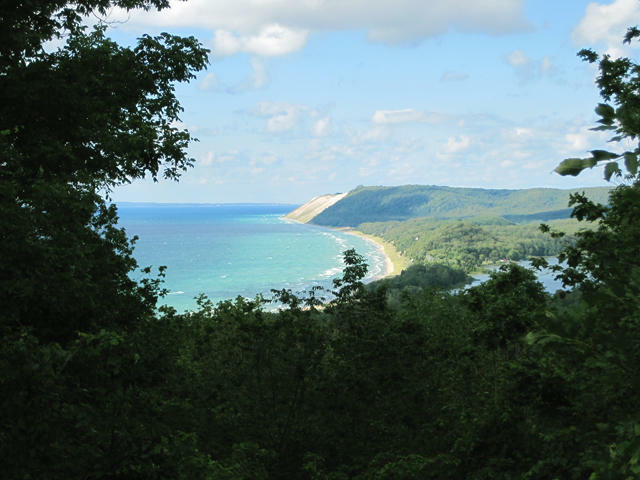 Lake Michigan, as seen from the Empire Bluff hike. Gail Krantzberg is the director of the Centre for Engineering and Public Policy at McMaster University and one of the co-chairs of the project. She says the lakes need a better plan than we've had in the past. "I’ve witnessed us doing haphazard good things in the Great Lakes, but it’s always repairing the damage done, it’s always reactive. This is an opportunity to actually set a path forward for the next 20-50 years, where everybody understands what needs to be done and we finally have a forward-looking vision about how to make the Lakes excellent and resilient to change," says Krantzberg. "There’s a lot of gray hair here. We really need to get youth mentored now, so that when I retire in... whatever... 20, 30 years – I’m being optimistic – that there are excellent leaders who have taken up the charge of making the lakes great," she says. So – these teams of grad students (with at least two faculty mentors per team) spent the past three months researching the biggest things that drive change in the Great Lakes region. "You can imagine just pulling all this information together and trying to find a picture out of that and then projecting that into the future, we’re talking about literally hundreds, maybe thousands of variables that affect conditions in the basin. So daunting, very daunting." Yesterday, the student teams presented their work. They laid out a couple different scenarios for the future. So, for example, the team assigned to invasive species had four different possible futures. They had to imagine what the future might look like if regulations on ships change... or what might happen if we don’t close canals. Don Scavia directs the Graham Institute at the University of Michigan. He’s another chair of the project. "The room was filled with some very hardened, practical people that’ve been dealing with these problems for a long time," says Scavia. He says they set things up this way on purpose, because he likes making people a little uncomfortable. He calls it dynamic tension. "So what we have is a mix of innovation and ideas for the future with a sort of 'been there, done that' mentality, and we think the tension between those two things are going to get us new ideas that wouldn’t come to the table if we did either one by themselves." And in fact, that’s one of the things that drew George Kuper to the workshop. He’s with the Council of Great Lakes Industries. "We look at future scenarios quite often and we too rarely have gotten the perspective of the people who are going to have to live in that future," says Kuper. Next, everyone - with all these different points of view - will sit down together and imagine four possible futures for the Great Lakes. They’ll take a look at what policies are in place and where we’re heading as a region... and whether we want that kind of future. They’ll have another workshop, and hold a public forum. Then, they’ll take the show on the road to Ottawa and Washington D.C. to get lawmakers involved.